Music can be a powerful tool to connect and uplift people, and for many years, promoters have been using taking the initiative to use their platform for good. Lauching at the end of this month, Natural Selektion is striving to make a difference in people’s lives, by bringing the E.L.E charity onboard for its inaugural event. With E.L.E taking over the Sekret Stage at Natural Selektion on September 29th at Bergsig Trout Farm, the Cradle of humankind, we took some time to find out more about this inspiring charity and the work they do to change the lives of many children in South Africa. What was the basis for creating E.L.E? Everybody Love Everybody (ELE) is a not-for-profit organization that came into being in June 2012, when an orphanage with close personal ties to the founders fell on hard times. This highlighted a desperate need within our community and couldn’t be ignored. A socially motivated initiative was born. An initiative which looks to provide world class experiences without requiring participants to spend outside of their normal spending habits. An initiative which brought people together by affording them the opportunity to give back. ; whether this be through donation of time, resources, connections, funds or by simply participating in one of our events. We call this partying with a purpose and it is our brand of social capitalism. How do you work with the entertainment industry to create awareness for the charity? ELE has used an organic growth model to create awareness around the charity. We put a lot of time, effort and love into our events, focusing on the small details and making the entire experience as enjoyable as possible whilst reminding them that they are giving back at the same time. In doing this, we believe that attendees will spread the word to their friends and our community will grow naturally. What are some of the success stories of E.L.E's work? In terms of fund-raising, our Beats in the Bush event, has been a massive success. It grew from 120 attendees in 2012 to over 900 in 2016. In terms of the uses of the funds that we have raised, ELE has been supporting 2 children’s homes and has been sponsoring 9 children through school. We have had one of our learners finish matric and has gone on to Beauty School and then another is finishing matric this year with the hope of studying psychology next year. What other mediums do you use to create awareness? We try to create awareness through our social media pages on Facebook and Instagram and through collaboration with other NGOs and event organisers, such as the Natural Selektion team. E.L.E is also taking part in the Telkom 947 Cycle Challenge. Tell us about your involvement there and how can fans support your cause? If you are keen to ride for the ELE team, please contact Thalia at thalia@ele.org.za or come visit us at our power zone on the day. How will Natural Selektion be helping the E.L.E cause? The Natural Selektion team are helping the ELE cause by spreading our message to their fans and also by donating R5 of every ticket purchased to our Education Initiative. 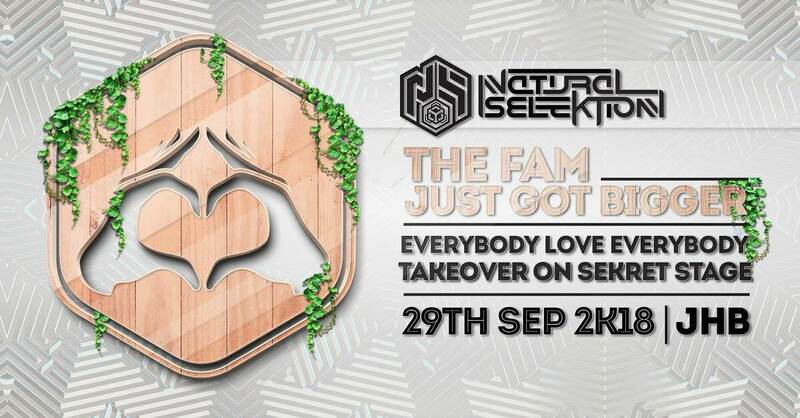 There will also be a Donation Station at the entrance to the Natural Selektion party on the 29th September where blankets, clothes and non-perishable foods can be donated, all going to one of the children’s homes that we support. What can we expect from E.L.E in the future? ELE is hoping to grow its Education Initiative to include a further six children in 2019 to take the total group to 15. We will also continue to deliver exciting, fun and unique events to the Joburg calendar on our own and through collaboration with other events. Visit the ELE website here. Tickets for Natural Selektion available from Pulse.